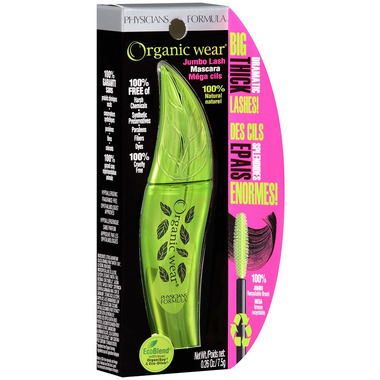 Physicians Formula Organic Wear Jumbo Lash Mascara gives you 100% Dramatic Volume & Glamour. 47% of the Total Ingredients are from Organic Farming. OrganiSoy Moisturizes and helps nourish lashes. Eco-Olive a natural antioxidant, shields lashes from harsh environmental aggressors. Directions for Use: Sweep mascara brush from lash base to tips. Apply multiple coats for added volume. Can easily be washed off with soap and water or removed with Physicians Formula Eye Makeup Remover Pads or Lotions. Ingredients: Citrus Aurantium Dulcis (Orange) Fruit Water. * Glycerin. Iron Oxide. Microcrystalline Cellulose. Glyceryl Stearate. Water. Beeswax. * Jojoba Esters. Tapioca Starch. * Copernicia Cerifera (Carnauba) Wax. * Stearic Acid. Glyceryl Caprylate. Aloe Barbadensis Leaf Juice. * Cellulose Gum. Cucumis Sativus (Cucumber) Fruit Extract. * Glycine Soya (Soybean) Oil. * Hydrolyzed Oryza Sativa (Rice) Protein. Leuconostoc/Radish Root Ferment Filtrate. Magnesium Aluminum Silicate. Olea Europaea (Olive) Leaf Extract. * May Contain: Titanium Dioxide. Hypoallergenic. Fragrance free. Opthamologist approved. I like that it's a clean product however it's a bit tacky. I find my lashes stick together rather than fan out beautifully. Very clean product but does not make my lashes full or last more then half a day. Unfortunately I won't be buying again. I really love this product. It's light, no harsh chemical and make beautiful eyelash. Leaves smudges under my lower lashes. Goes on silky and looks nice though. I use a powder puff to try to coat the underside of my lower lashes but still end up with smudges. When I used the Jumbo Lash Mascara a couple of years ago I found it clumping and smudging. In the hindsight, it was probably making my eyes water slightly, so that must've been the reason for smudging. After reading lots of other reviews I tried Physicians Formula Organic Wear 100% Natural Origin Mascara - now this one stays on because it doesn't make my eyes water! So far, I LOVE this stuff. I am a bit concerned about how it will run in the rain, but since this is a fairly dry city, I hope I never need to know. seems okay...would agree the packaging is a bit much for such a small product. I really wanted to love this mascara, having spent a lot of time switching all my cosmetics over to organic lines. However this one did not live up expectations. The large plastic bristles make it difficult to apply and the mascara flakes off easily. I would often have smudges under my eyes before I even got to the office. I went back to my non-organic mascara that I have been using for the last 15 years. I quite like this mascara provided you're not out in the rain. It is thickening and dramatic and washes of easily. As mentioned in other reviews, this mascara does not stay on very well and there is a tremendous amount of packaging. I dislike the brush which is extremely large making it difficult to apply. Unfortunately, I bought two of them. I won't purchase again. I live on the west coast where the air is very moist - this mascara does not stay put on me at all. I don't usually need a waterproof mascara out here, but this product melts off in humidity or mist. My lashes also brush my cheeks when I blink, and the product wears off on contact during the day, so I end up with little black dots on my cheeks. I was surprised it came in such a large, wasteful plastic package too - it's in the "organic" line - shouldn't the packaging at least be recyclable? I also didn't see anything on this package saying the product is cruelty-free, which surprised me. I assumed all products in the "organics" line would be cruelty free. I do like how it goes on, but all in all, I won't but this product again. Had been buying ecco bella for some time now, but seems you dont carry it anymore. It gave me a chance to try this product which was new to me.I am very satisfied with it, it makes your lashes look longer with little effort n my part. So will buy this one again! Another excellent Physican's Forumla product. Makes lashes seem longer. Separates them while maintaining a clean feeling. Stays on a long time.